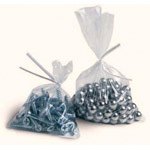 Flat plastic bags, also called poly bags, are used to package products throughout industry. Polybags have an endless spectrum of uses. One of the main advantages of packaging in a plastic bag is that they are easily sealable using a heat sealer. Poly bags are exceptionally clear and do not become brittle with age. Made from virgin low and linear low density polyethylene. Meets FDA requirements for use in food applications. Designed to handle a wide variety of packaging needs. Heat sealable.